When it comes to furnishing your home, your wallet can take a real beating. When in the market for furniture, many people initially believe that purchasing new furniture is the only way to ensure they get quality furniture in a timely manner. However, this is not always the case. In many situations, buying used furniture is a more cost-effective option, especially for those trying to stick to a budget. When it comes to used furniture, though, you have to be careful. You do not to just buy items off classified listings or websites — that can be a waste of money! Instead, it is a better option to purchase used furniture from a consignment store. Consignment furniture is a option for those looking for quality, gently-used, and affordable furniture. At Consignment Furniture Showroom and Gallery, we offer a wide selection of furniture available for your home, including furniture for the bedroom, living room, kitchen, office, and other areas throughout your home. Whether your style is casual, traditional, or contemporary, we have unique and affordable pieces that will look beautiful in your home and suit your needs as well as your budget. We get it, some people are skeptical about buying secondhand furniture, but it can be very beneficial. In this blog we are going to take a look at the benefits of buying consignment furniture. Shopping for new furniture at a retail store often comes with an expensive price tag — not to mention, the additional costs and fees of delivery. If you are just starting to furnish your home, buying all new pieces may be difficult to do, especially if you have a limited budget. Used furniture is offered at significantly lower prices over new pieces, which means that you can fill your apartment or home without going over your budget. What’s more, you can even find premium and designer brand furniture at a fraction of the price. And, when you purchase used furniture, you often have the option to take the piece home with you the same day, eliminating any fees associated with furniture delivery. When you choose to buy used or consignment furniture over new, you are given the opportunity to own unique pieces, some of which are no longer available. Whether you get used antique furniture or modern, adding it to your home will create its own uniqueness. Additionally, you may also find used furniture that inspires you to reupholster or paint to add even more visual intrigue to your home. Many people are choosing to furnish their home with flat-pack furniture — meaning that it comes in a flat box and you put it together yourself, usually by following complex instructions. These cheap furniture items can be conveniently found at supercenters and some retailers, but you will get what you pay for. It won’t look great, and it definitely will not last very long. For the same low price or less, you can purchase quality used furniture when you shop at a consignment furniture store. When you shop at a consignment store with quality in mind, you will be likely to find furnishings for your home with finer craftsmanship and better materials than expensive new pieces. Many furniture companies have a manufacturing process that pollutes the environment and uses natural resources. When you buy furniture on consignment, you are eliminating a few carbon footprints. Additionally, without the need for new furniture or packaging, you eliminate the use of materials and chemicals that are used to create new pieces, which is good for the environment. As mentioned above, used furniture gives buyers the choice to get creative and make it their own. Repurposing furniture and other home decor is a popular trend in today’s interior design. There are plenty of helpful ideas on the internet that can be applied to refurbish used or old furniture. This includes helpful tips and advice on how to repaint, repair, or even redesign any furniture item. Once you buy a used furniture item, you can design it how you want and give it a color of your choosing. No one will be able to tell it’s a refurbished item and will complement its uniqueness. While furniture delivery is not always a requirement with consignment furniture, it can be done. That said, compared to purchasing new furniture from high-end designers, you will not have to spend weeks waiting for the item to arrive. Whats worse, when you purchase new, you are often left with the task of assembling the furniture by yourself. Pre-owned furniture, on the other hand, is ready to go when you need it and typically comes pre-assembled. As you can see, there are plenty of benefits of buying used or consignment furniture. 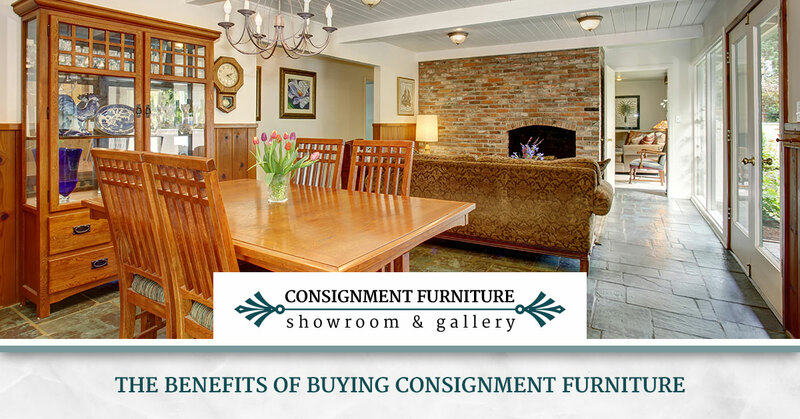 If you are looking for used furniture stores in St. Petersburg or Clearwater, instead of buying new and overpriced furniture, head to Consignment Furniture Showroom and Gallery! You will be sure to find the furniture you need in our 8, 000 square feet of space. We carry a wide selection of quality furniture pieces in good condition that will fit perfectly in your home, including kitchen furniture, bedroom furniture, furniture for your kitchen, and so much more! Additionally, we also offer furniture delivery! To learn more about our available furniture pieces, check out our online inventory! If you have any questions, please do not hesitate to contact us!